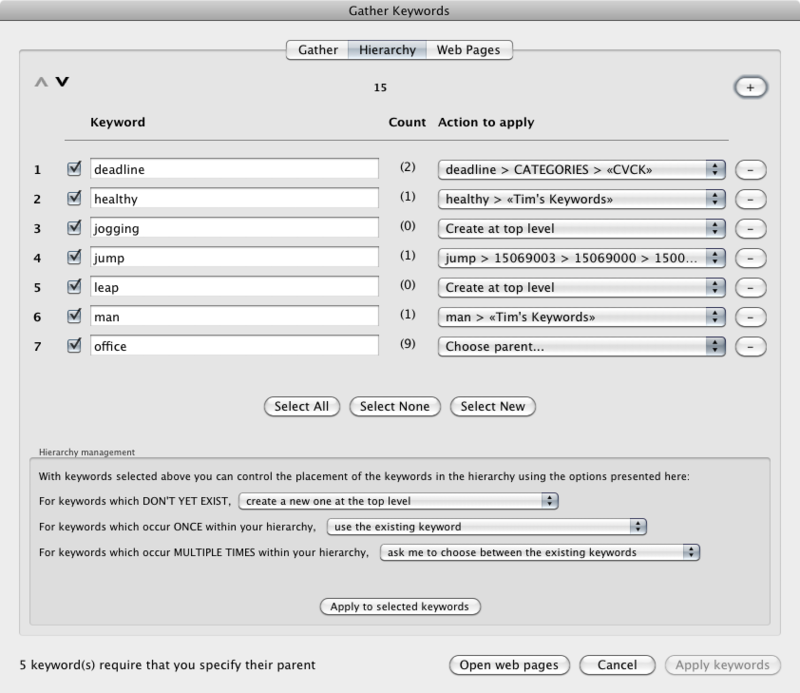 By default Keyword Master create keywords at the root of the keyword hierarchy, however advanced users who have a more organised keyword collection may find this a little limiting. The 'Hierarchy' tab provides more control over the placement of each keyword, and you should move to this tab once you've finished gathering your keywords. Keyword Master finds any existing occurences of each of your listed keywords in your current hierarchy, it then allows you to choose an appropriate action for each keyword that you gathered. New keywords may be created either in the root or under a keyword called "Keyword Master". The latter is intended to provide clean holding area for keywords that will be moved elsewhere in the hierarchy at a later date. For existing keywords the plugin allows you to either create a new instance or else choose which occurance of a keyword to use. This is a powerful feature for users of controlled vocabularies such as the one provided by David Riecks. The controls at the bottom of the tab allow you to specific the keyword action for all the selected images (those which have been ticked), thus saving you time. You may specify separate actions for new keywords, those that only have one existing instance and those that have multiple occurences. Press "Apply to selected keywords" to set the choice you've made. (Note that this will just set the action in the corresponding menu for each keyword, it doesn't actually apply the keywords to the images).